The fishing pliers are made of high quality stainless steel, corrosion-resistant, durable and saltwater approval. 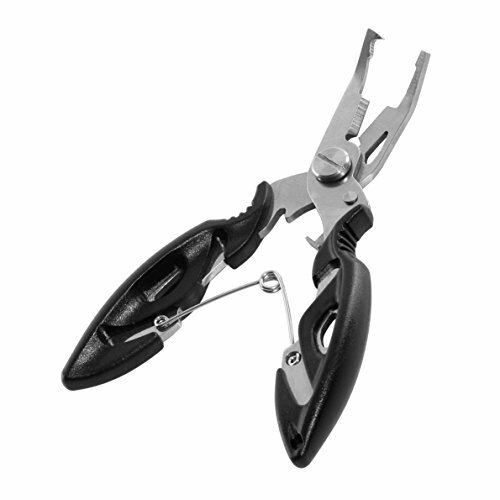 This fishing pliers can be used as braid cutter, hook remover, split ring remover, fishing pliers and so on. Especially perfect for cutting all types of fishing line, such as braided, nanofil, mono, filament, fluorocarbon, fly line, and leader materials. Features an ergonomically molded comfort grip handles for one handed use. Keeping your hand from unnecessary fatigue or slipping while using the pliers. The lock latch designed, the pliers mouth will not open when it is not in use. Great for both saltwater and freshwater. 1 x Fishing Pliers + 1 x Nylon SheathErgonomically molded comfort grip handles for comfortably using. Comes with a nylon sheath. Perfect for cutting fishing line, such as braided, nanofil, mono, filament, fluorocarbon, fly line, and leader materials. Can be used as braid cutter, hook remover, split ring remover etc. Narrow serrated nose designed, make it reaches deep into fish’s mouth for hook extraction. Made of High quality stainless steel, Eco-friendly, corrosion-resistant, durable and saltwater approval.